I love to try to understand the thinking process children are going through as they work to solve a problem involving objects in space—putting a puzzle together, making a system to carry toys, figuring out which arm to put into a coat sleeve and balancing blocks. What is the motivation and what is the goal for a child working in the housekeeping area, trying to figure out how to store all of the play food in the microwave when pieces keep falling out? I wonder what they are learning. As children look for solutions to these kinds of problems, we can encourage them to think about what the difficulty is, and explore possible solutions, perhaps more than one solution. Looking at an engineering design process graphic we can see that designing a best solution for a problem is a process that continues, with solutions being tested, reconsidered and redesigned. The October 2013 issue of Science and Children has many resources about engineering practices and how to engage young children in an engineering design process. Beginning with this issue, Science and Children has a new column called “Engineering Encounters” on teaching strategies to support teaching children how to design, explore the ways engineers conduct their work, and include ways in which lessons in engineering can be integrated with science. Reading this month’s engineering column, “Minding Design Missteps,” I learned about the habits of beginning designers and tips for steering them in productive directions. The Guest Editorial, The Next Generation Science Standards and Engineering for Young Learners: Beyond Bridges and Egg Drops by Mariel Milano (pgs 10-16) points out the differences in the engineering design process for different grade levels, also described in the Next Generation Science Standards Appendix I—Engineering Design in the NGSS. You may have children in your class who are avid builders, developing their knowledge of the center of gravity, size and weight, the nature of wood, parts-of-the-whole, classification, symmetry, spatial relations and social skills as they work with others in the block area or with natural materials outdoors. These children may always choose a building activity and must be enticed to other activities such as painting at an easel. Other children seem to live at the art table or in the pretend area of a classroom and don’t seem to have the need to build. Early childhood educators know that children can develop skills and knowledge in each of the classroom areas. We can encourage imaginative play in the block area to strengthen children’s ability to interact with others, learn to transform themselves into another role and take on the perspective of someone else. And we can bring building activities to the pretend area to give all children the experiences to develop their knowledge of the center of gravity, size and weight, the nature of materials, parts-of-the-whole, classification, spatial relations, and symmetry that are so obviously developing in the block area. In the block area, read a book that has a storyline with multiple perspectives such as Mike Mulligan and His Steam Shovel by Virginia Lee Burton (1939, 1967), Building With Dad by Carol Nevius, illustrated by Bill Thomson (2006), The House in the Meadow by Shuta Crum, illustrated by Paige Billin-Frye (2003), and The Lot at the End of My Block by Kevin Lewis, illustrated by Reg Cartwright (2001) (Thank you to Marie Faust Evitt and Bobbi Weesen-Baer for the extensive book lists in Thinking BIG Learning BIG.) Invite the children to re-enact their favorite part of the book, or a story of their own making. Blocks can be used for the stage and the characters, or the children can take the parts of the characters. Reading a book that illustrates different kinds of buildings may inspire children who use art materials in two-dimensions to move to three-dimensions, if scraps of wood, cardboard tubes, corks, bottle lids and small boxes are provided. Here is a short list—add your suggestions in a comment, below. Animal Homes series from Capstone, e.g. Animal Homes: Squirrels and Their Nests by Martha E. H. Rustad. 2005. Bridges Are to Cross by Philemon Sturges, and Giles Laroche, illustrator. 1998. Galimoto by Karen Lynn Williams, Catherine Stock, illustrator. 1990. Houses and homes by Ann Morris. 1992. Shapes in buildings by Rebecca Rissman. 2009. Older elementary students can participate in engineering design work from the Engineering Is Elementary curriculum and story books. There are 20 units, meant to be taught either concurrently or after students learn the appropriate science content. Where do the young engineers and designers go from there? In Washington, DC, the Design Apprenticeship Program (DAP) of the National Building Museum provides a group experience for teens to work in groups with design professionals to solve a design problem. One DAP design challenge was to design and build a piece of furniture that would benefit residents in transitional housing. Support children’s problem-solving with multiple opportunities to be challenged and encouraging words that reflect what they are doing successfully. 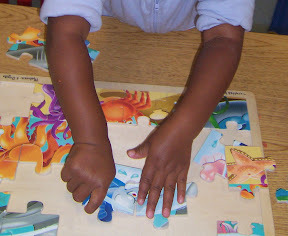 This entry was posted in Early Years and tagged activity ideas, blocks, books, early childhood, engineering, problem-solving. Bookmark the permalink. Trackbacks are closed, but you can post a comment. Engineering students at the University of Virginia have a space for experiential learning. Congratulations to the teens who participated in, and the National Building Museum staff and volunteers who led, the “Investigating Where We Live” program to explore, document, and interpret the built environment in D.C. neighborhoods. Their work was recognized by the President’s Committee on the Arts and the Humanities (PCAH), in partnership with the National Endowment for the Arts (NEA), the National Endowment for the Humanities (NEH), and the Institute of Museum and Library Services (IMLS).